Parliament of India is the legislative organ of the Union Government. Parliament has a central position in the Indian democratic political system due to adoption of Parliamentary form of Government based on United Kingdom political setup. Parliamentary form of government is also known as Westminster model of government. 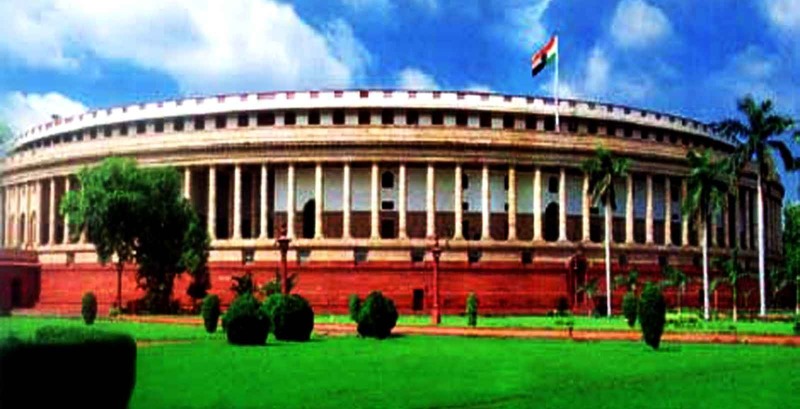 Parliament of India consists of the President, Lok Sabha and Rajya Sabha. Lok Sabha is also known as Lower House/First Chamber/Popular House/House of the People. Rajya Sabha is also known as Upper House/Second Chamber/House of Elders/Council of States. Rajya Sabha represents the States and Union Territories of India. Lok Sabha represents people of India as a whole. President of India is not the part of any House but is an integral part of Parliament because without his assent no bill can become a law. Indian Parliament represents British political system and not American political system. 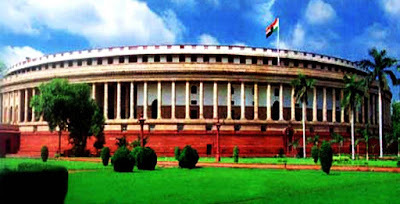 Parliament of India which is Parliamentary form of Government emphasizes on interdependence between legislative and executive organs whereas Presidential form emphasizes on separation of legislative and executive organs. Lok Sabha - Maximum Strength is 552 out of which 530 are to be from states, 20 from Union Territories and 2 members to be nominated by the President from the Anglo Indian Community. However currently our Lok Sabha has only 545 members, the reason for which is that the 7 vacant seats (552-545=7) are left for the areas of Pakistan Occupied Kashmir. Rajya Sabha - Maximum Strength is 250 out of which 238 to be sent by the states and union territories and rest 12 to be nominated by the President. Currently there are 245 members of Rajya Sabha, the rest 5 left vacant for future adjustment. The fourth schedule of the Constitution decides the Rajya Sabha seat allocation. Lok Sabha - The normal duration is 5 years after which it automatically dissolves. However President can dissolve the Lok Sabha earlier than its stated tenure. The period of Lok Sabha can be stretched during National Emergency. Rajya Sabha - Continuous & Permanent Chamber not vulnerable to dissolution as the elections to it are indirect. One-third members of the Rajya Sabha retire every second year and the seats are filled up by fresh elections and nominations by President. Also the retiring members of the Rajya Sabha are eligible for reelection for any number of times. When the Constitution was promulgated the duration of the tenure of the Rajya members was not decided and left at the discretion of the Parliament. So an arrangement was made in the Representation of People Act 1951 that the tenure of a Rajya Sabha member would be 6 years.